The mudfish, crescent moon and star decorations establish this vessel as one commissioned for the grave of a chief or paramount chief. 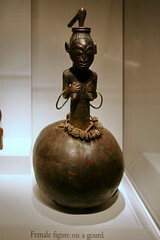 The musical instruments refer to the chief's role as priest of the royal ancestral cult and have multiple meanings associated with proverbs, history and human relationships. The snakes, a Gabon viper and a boomslang, symbolize the chief as the ruler of both the forest and the savanna.